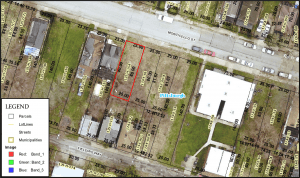 Located between N. Lang, and N. Murtland St. in Homewood, Pittsburgh, PA the Black Urban Gardeners and Farmers Cooperative of Pittsburgh (BUGs FCP) work on several parcels of land leased through the City of Pittsburgh’s adopt-a-lot program. BUGs thrives on a mission of serving as a collective of Black men and women involved in urban gardening and food justice for black people. As part of this mission, BUGs operates a farm market that offers cooking demonstrations and outreach efforts that touch upon topics and issues in the Black community such as gentrification and increasing economic opportunity. Additionally, BUGs partners with 412 food rescue to make monthly food deliveries to neighborhood residents. Office of Property Assessments in Allegheny County. As part of an ongoing urban farm project, BUGs is seeking to utilize vacant parcels diagonally located from their hoophouse on Monticello St. 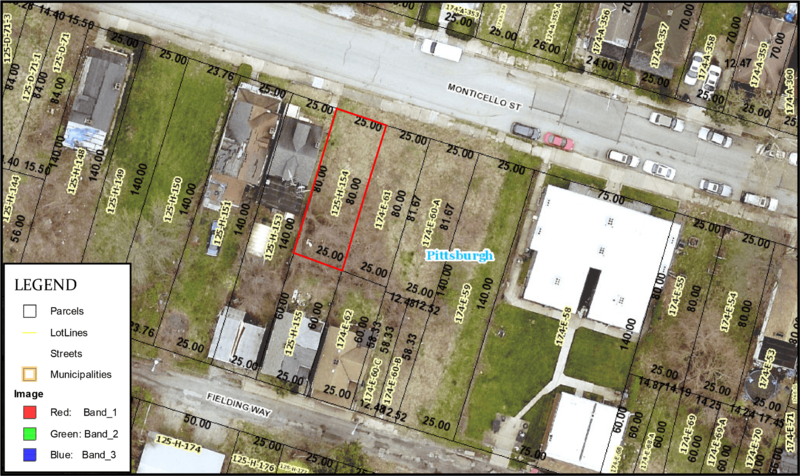 These are the lots for the Bank of America Grant Project and are located on the north facing side of Monticello Street encompassing 11,000 square feet of vacant property. The parcels for this future urban farm site are 125-H-154, 174-E-61, 174-E-60-A, 174-E-59. The success of this site as a potential future urban farm has two major limiting factors. Firstly, a soil analysis of the site indicated lead contamination. Full scale soil lead testing was conducted by the Allegheny County Conservation District, which revealed lead levels exceeding the bare soil maximum requirements (400 ppm) for cultivation on this site. Though the highest tested values represent “hotspots” for lead contamination, restrictions at the city level limit the use of the entire site. Therefore, remediation strategies need to be implemented before the site can be used to grow produce. Ground cover on this site is primarily turf with a large patch of Japanese knotweed on parcel 125-H-154. Additionally, there are several places with bare soil and construction material that remains from the demolition of previously standing structures. Till and plant cover crops on site. A randomized soil sampling took place on this site on September 14th, 2018 and results were returned on September 21st, 2018. 10 soil core samples were extracted using a 1” diameter soil core probe in the front of the site and an additional 10 core samples were extracted from the back. These samples were homogenized by hand in a 5 gallon bucket and ½ cup of soil was placed in a plastic bag. These two final samples were sent PSU Agricultural Analytical Services Laboratory for a mixed vegetable soil analysis. The goal of the nutrient test was to assess the current growing conditions in the existing soil. This would aid in the selection of cover crops and in particular whether or not there were any nutrient deficiencies that we could address at this stage of site planning and development. Particular attention was also given to the soil pH. It is well documented that soil pH is often higher in cities because of the additions of foreign materials into the soil as well as road salts. Thus the high pH in the soil at this site was not surprising, but needed to be lowered in order to plant the cover crops. For the cover crop planting sulfur was incorporated in the top 1” of soil at a rate of 2 lbs. per 100 sq. ft. Organic matter can be another method of lowering soil pH. In this case organic matter is a desired end result of the cover cropping and it is hypothesized that the incorporation of the cover crops back into the soil as organic matter will further aid in lowering the pH. Other nutrient values indicated in soil test showed that NPK was present in excessive amounts for the needs of mixed vegetable production. As such, nitrogen fixation or other nutrient additions were not considered in the final selection of cover crops. Timing: working with multiple leaders from different organizations meant that we needed to ensure that the ultimate cover crop selection was one that would be most successfully germinated in the time that was available for the parties involved. This meant looking at later season cover crops. Soil conditions: Given the excessive nutrients and high pH in this soil, a hardier crop needed to be selected for this site. This meant coordinating with extension and outreach organizations to gather information regarding the true durability of certain cover crop varieties. Lead contamination: Lead contamination receives special attention in regards to cover cropping because the plants selected need to have deep rooting structures and bountiful above ground biomass for maximum dilution. Deep roots provide additional benefits in the urban setting through the breaking up of urban soil compaction. Location: When engaging in urban farming there is a necessary consideration that needs to be given to the aesthetics of the neighborhood. Unkempt lots not only can decrease property value but can also lead to safety hazards such as pest infestation. As a result, cover crops need to be planted in a way that indicates that they are both intentional and providing a service to a particular area. In this instance, the design of the cover crop plots in strips rather than covering the entire site was a way to indicate that there was more intentionality to the project. As the cover crops increase in size a strategic layout aids in maintaining the appearance of intentionality. The cover crops selected for this project were Cereal Rye and Clover. Winter (Cereal) Rye: Rye is a good choice for a late fall cover crop. It is an upright cool season annual that grows 3 to 6 feet tall. It has a minimum soil germination temperature at 34 degrees F, which makes it perfect for an October planting despite unseasonably cool temperatures. As a crop it has an excellent tolerance to low sol quality and can create a generally denser ground cover. A denser ground cover is idea in contaminated soil because it limits the bare soil contact for people passing through the space. This crop can also tolerate flooding or ponding, another common characteristic of urban plots – particularly ones with widespread compaction. Rye also scores higher than other crops in its ability to loosen subsoil. Rye was the primary focus for this cover crop project however, the key with cover crops is diversity. The most soil fertility benefits are achieved with more diverse plantings. Clover: Clover is best known being a source of nitrogen as well as its grazing and forage value. Although nitrogen fixation was not a goal of this cover crop project, including clover ensured a level of needed diversity. It was one of the potential crops that could be selected based on both availability and seeding date. Typically, clover is seeded in mid to late September when used as a winter cover crop, but can be plated as long as soil temperatures remain above 42 degrees F. Another benefit of partnering clover with rye was the height differential. Cover is shorter than rye and therefore adds a height diversity to the mix. It also grows rapidly and thus will provide quick benefit that will aid in the establishment of the rye when seeded at the same time. Clover is also a more attractive cover crop adding to the potential need for an aesthetically pleasing project. As is common in many urban plots there was a considerable amount of rubble and housing debris that remained in the soil, which was uncovered during the first tilling. In order to avoid damage to the equipment, the first tilling was cut short to allow for further exploration into the site. Following a coordinated volunteer work day at the BUGs sites on, students participating in Pitt Make a Difference Day aided in the hand removal of brick and rock from the selected portions of the site to increase ease of tilling. Once the majority of the rubble was removed from the selected parts of the lot, tilling commenced the following week. Upon further inspection of the site, it was discovered that a considerable amount of unevenness emerged once the majority of the brick material was removed from the ground. Given that the goal of this project is to lower lead levels and begin soil fertility restoration, leveling the site was not conducted at this time. In the spring when it is time to till the cover crops into the ground, additional soil and fill material will be brought to the site to reduce the unevenness. It will be incorporated at the same time that the cover crops are tilled into the ground. Seeds were cast for the cover crops by hand then massaged into the soil for optimal contact. Afterwards, straw was added to increase protection from colder temperatures as well as aid in moisture retention. With all projects there are challenges and opportunities. This project was no different. Firstly, it was a pleasure to help the coordinators at BUGs take the first steps in remediation of the soil in this site. The work that this organization does in Homewood is exemplary and it was very exciting to take part in facilitating their goals. Secondly this is not a project that would not have come to fruition without the help of outstanding community partners like Grow Pittsburgh, the Allegheny County Conservation District, The University of Pittsburgh, and the Bank of America Grant Committee. Urban agriculture projects rely on the collective expertise of those in the community and it continues to impress me how much we are able to accomplish when we work together by bringing what we can to a project. Moving forward with the goals of using this site, the next steps will be to till and incorporate the cover crop material into the soil when the ground thaws in the spring. Typically, one season is not enough to reap the full benefits of cover cropping, but we can certainly anticipate a decrease in the lead levels. Certain parcels on the site had lower initial levels and it is possible that the first round of cover crops will be enough to lower the lead levels to allow planting. Once the cover crops are re-incorporated a second round of lead testing will occur on the site to indicate the progress made in this first part of an ongoing project of remediation and urban agriculture. Although the project had a majority of success there were some challenges that arose. Firstly, the presence of significant amounts of housing material in the soil slowed the progress of the tiller and extended the amount of time we needed to dedicate to each activity. Additionally, this extended our planting dates further into the season during which a cold spell potentially decreased the success we will see in the germination rates moving forward. Thankfully our cover crops are more hardy and therefore still have a good chance of survival. Finally, personal tragedy affected our team and limited our ability to complete the planting of grape vines along the fence on the property. For the time being, this aspect of the project has been suspended, and full attention will be given to the maintenance of cover crops and soil fertility management. Despite our setback, this was a successful project that I was excited and honored to have coordinated for BUGs.